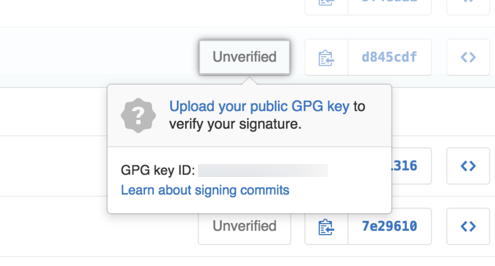 Before signing commits and tags with GPG, GitHub Enterprise will confirm that your GPG signatures are cryptographically verifiable using OpenPGP libraries to ensure your signatures can be trusted. 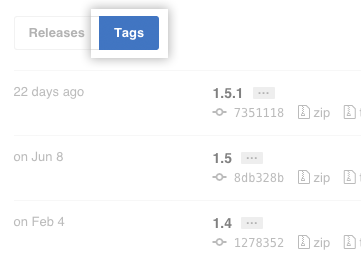 You can check the verification status of your commit and tag signatures on GitHub Enterprise. Next to your commit's abbreviated commit hash, there is a box that shows whether your commit signature is verified or unverified. To view more detailed information about the commit signature, click Verified or Unverified. If your commit signature is unverified, you can learn more about why by clicking the Unverified box. Next to your tag description, there is a box that shows whether your tag signature is verified or unverified. To view more detailed information about the tag signature, click Verified or Unverified. If your tag signature is unverified, you can learn more about why by clicking the Unverified box. "Signing commits and tags using GPG"